SA-Dakar Rally: Leader Cyril Despres "SS 13 was psychologically very tough". KTM factory rider Cyril Despres on Saturday extended his overall lead in the 2012 Dakar finishing second in the penultimate stage just 47 seconds behind Portugal’s Helder Rodrigues. 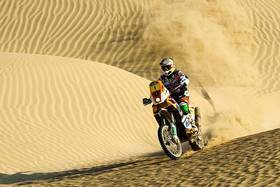 But it was all drama for his teammate Marc Coma who had to slow down in the early part of the stage due, he said, to mechanical problems. He then made a costly navigational error in the dunes of southern coastal Peru and sacrificed about 13 minutes. 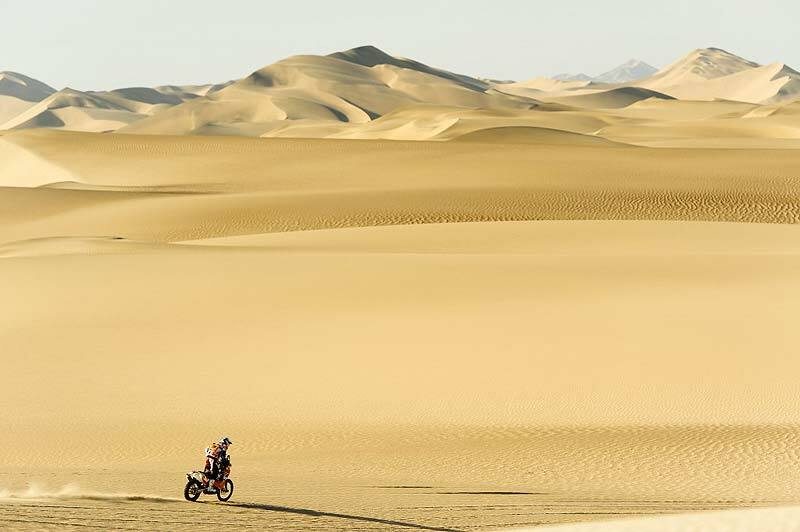 The two KTM riders are far in front of the rest of the field in the overall standings so Cyril Despres goes into the final stage as a prospective winner of the 2012 edition when they head for the finish line in Lima tomorrow. 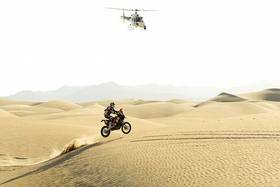 While it is never over until it is over, a change in the final standings will require a dramatic error by Despres that will reverse the current situation and prevent him from taking his fourth Dakar title. It was at the 207 km mark that Coma was reported to have overshot the course by around 2 km. Coma started the stage some six minutes ahead of Despres but by the time he got back on track after losing his way he was almost 13 minutes behind his rival. Speaking at the end of the stage. Ironically Coma had actually cut into Despres’ lead at the 186 km mark at the entrance to the dune section on Saturday and at that point the Frenchman’s lead had shrunk to a mere 2 minutes 14. Coma now goes into the short 29 km final stage to Lima knowing his rival has a lead of 11 minutes. 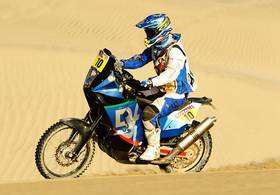 Both Coma and Despres are three times Dakar winners and have been the dominant force in the 2012 edition, winning nine stages between them. Despres said after the stage that it had been "psychologically tough". "I am not the kind of person who derives pleasure from the problems of teammates, and even less when it is Marc Coma who is in trouble," he said. "I took no risks but I tried to gain ground on other riders. I saw I had clawed back five minutes from Marc at the refueling point. Then I got lost a couple of times. It was never a big problem but I had to stay focused. Today's stage was psychologically very tough. I always wait until the last day to enjoy things. I have seen so many things happen at the Dakar, and even more today. I want to stay calm and enjoy things a bit more." Marc Coma: "I started very fast, as fast as I could, because I knew it would be difficult to stay in the lead. 25 km into the stage I had a mechanical problem that forced me to slow down and I feared I would not be able to continue. So I am happy to be here, in second position, which is quite good. I fought throughout the entire rally and gave it everything at all times. That is the way it is. I am disappointed because I was not able to fight until the end." Rodrigues is practically assured of the minor podium place when riders reach Lima tomorrow. 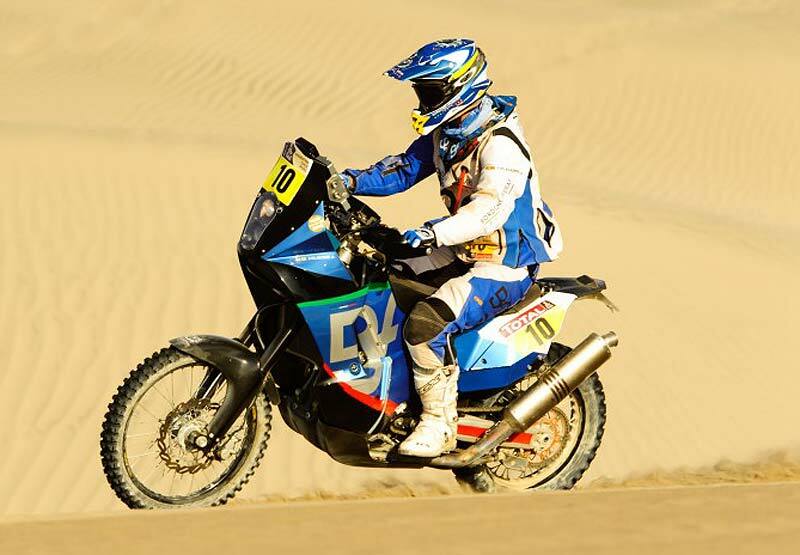 Although he is more than an hour behind the leader, fourth placed Spaniard Jordi Viladoms (KTM) is about 20 minutes behind him. At the close of Stage 13 eight of the top ten overall riders are riding KTM machines.